Humans of all ages engage deeply in game play. Game-based interactive environments provide a rich source of enjoyment, but also generate powerful experiences that promote learning and behavioral change (Pellegrini, 2009). In the modern era, software-based video games have become ubiquitous. The degree of interactivity and immersion in these video games can now be further enhanced like never before with the advent of consumer-accessible technologies like virtual reality, augmented reality, wearable physiological devices, and motion capture, all of which can be readily integrated using accessible game engines. This technological revolution presents a huge opportunity for neuroscientists to design targeted, novel game-based tools that drive positive neuroplasticity, accelerate learning, and strengthen cognitive function, and thereby promote mental wellbeing in both healthy and impaired brains. In fact, there is now a burgeoning brain-training industry that already claims to have achieved this goal. However, many commercial claims are unsubstantiated and dismissed by the scientific community (Max Planck Institute for Human Development/Stanford Center on Longevity, 2014, Underwood, 2016). It seems prudent for us to slow down and approach this opportunity with scientific rigor and conservative optimism. Enhancing brain function should not be viewed as a clever, profitable start-up idea that can be conquered with a large marketing budget. If the field continues to be led by overinflated claims, we will jeopardize the careful and iterative process of evidence-based innovations in brain training and thereby risk throwing out the baby with the bathwater. To strike the right balance, the path to commercialization needs to be accomplished via cutting-edge, neuroscientifically informed video game development tightly coupled with refinement and validation of the software in well-controlled empirical studies. Additionally, to separate the grain from the chaff, these studies and the claims based on them need verification and approval by independent regulatory agencies and the broader scientific community. 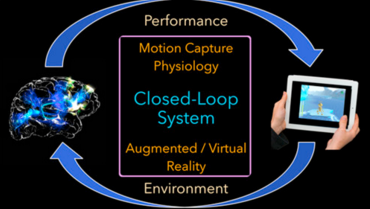 High-level video game development and rigorous scientific validation need to become the twin pillar foundations of the next generation of closed-loop video games (CLVGs). Here, we define CLVGs as interactive video games that incorporate rapid, real-time, performance-driven, adaptive game challenges and performance feedback. The time is ideal for intensified effort in this important endeavor; CLVGs that are methodically developed and validated have the potential to benefit a broad array of disciplines in need of effective tools to enhance brain function, including education, medicine, and wellness.